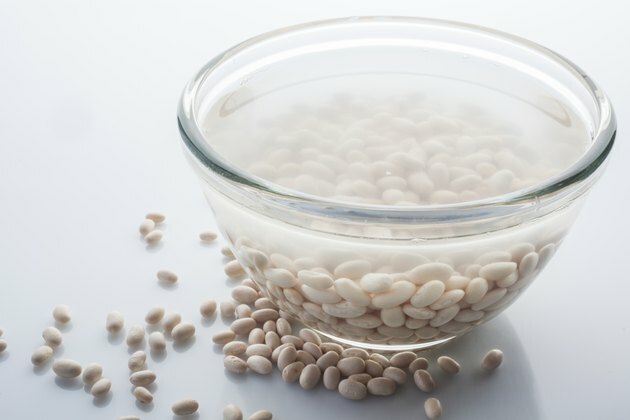 Great northern beans are a type of white bean that is available year-round in dried form in most markets and grocery stores. Great northern beans have a delicate flavor and are commonly used in soups and stews. High in protein, great northern beans make an excellent side dish for a variety of different main courses, especially in a vegetarian or vegan diet. While canned great northern beans are readily available and can simply be warmed in a saucepan, dry northern beans have a better flavor and consistency when prepared and cooked properly. Put the dry great northern beans in a colander in the sink. Rinse them with cold, clean water, and pick out any that look damaged, as well as any rocks or pieces of debris mixed in. Transfer the beans to a large saucepan or stockpot, and cover them with cold, clean water for 24 hours, discarding and replacing the water approximately every eight hours. Keep the lid on the saucepan or stockpot during the soaking process. Rinse the beans again with cold water. Place the beans in a large saucepan or stockpot, and add 3 cups of cold water. Put the lid on the pot, and heat the beans over high heat until boiling. Reduce the heat to low, and simmer the beans for 60 minutes. Season the beans with salt to taste after 60 minutes has passed. Allow the beans to cook for another 30 minutes, stirring them every 10 minutes. Serve the beans after 90 minutes has passed. Store any uneaten beans in an airtight container in the refrigerator for up to five days. Cilantro, jalapeno, garlic, onion, olive oil, butter, soy sauce and red pepper are commonly added to white beans right before you cook them in order to give them more flavor. Add ingredients sparingly if you are unsure of how much to add.